pretty much the same, yes. With Orion looking somewhat compressed (things look different at 24H) and Flowmotion showing some artefacts on edges when you lift the blacks (also things look different at 24H). Differences are negligible, though. Thanks for post the comparison. For me the GOP12 is the best when the blacks are pushed. I will now try the Gop12 settings. Report the resoults later. I made a quik test with the Gop12. The image looks very good in stills but by moving the camera jerks very much in comparison with Spanmybitchup. I tryed the 24p25p-NINE, don´t jerks like GOP12. Give me a medium of 36000 Kbps. 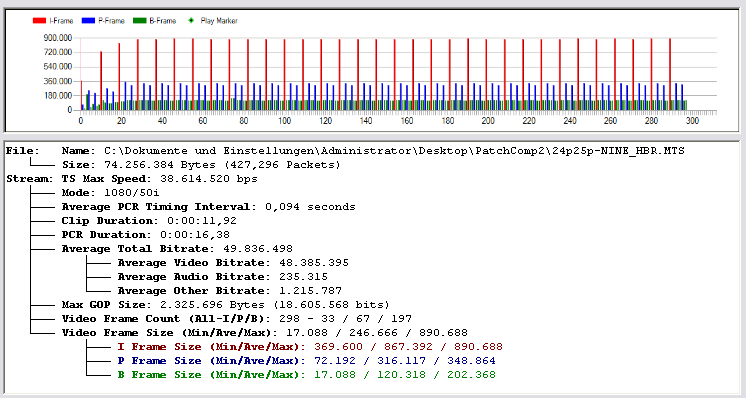 No problems with sandisk HD video 30mbps. Hope you continue with your work on HBR. @towi I have been working on findig settings around 50M, I have found end user only settings that work but I find the ratio between I-P-B frames don't look good. I found your settings and they look very promising. Indoor with fast panning i get as u say near 50M. I will go on testing your settings tomorrow in suny high contrast daylight. I certanly hope that your version 2 will work to. @towi This is your settings from yesterday outdoor suny high contrast daylight. Bitrate goes high. If that is correct or not I do not now, listening to @cbrandin about trick mode. @towi Sorry I must have mixed up my clips. It was ment to be HBR, but I can see that it was wrong. I have now tested your new setg setting of today. It looks promising but clip duration is 11:59 sec and PCR 15:40. Looking at filesize I think the bitrate is closer to 60M. Is that right @cbrandin, and what problems can this give? That's probably right. In a week or so I should have a new version of StreamParser that resonves this. There shouldn't be any problems except that many programs will misreport the clip length. Editors shouldn't be a problem as they only use elementary stream timers - which are OK.
HBR mode can have some strange timstamp issues, which I'm still trying to work out. Can you do me a favor? Run a clip with these settings for about 1 minute and post the report. That will help me get a handle on how much the TS timer is skewed. @cbrandin Yes I will do that, but have to finish my tests with my current firmware @towi setf. It is evening now so it will not be the same high contrast test, more like my first post from my kitchen:-). I'll try to change to a more challanging subject. I will update this post! I also have to thank your for your old settings. The 44 and 66 settings have been my favorites and it was the first settings I was testing with firmware 1.0 and 1.1. And they worked just fine. NTSC mode has been tested on death charts only ... no real world tests as I only use PAL mode. Feel free to optimize the patch for NTSC (of course). HBR PAL mode has been tested extensively. In my book at HBR/25p 24p25p-NINE offers the best IQ of all the patches I have tested... both with static scenes as well as with motion. Actually I would consider this patch as Sanity MKII. So once again many thanks to @Ralph_B, the creator of Sanity. And once again a big thank you to @Driftwood who helped me to built in the matrix of 24p25p-NINE. "Of course, one needs to thank all others that contributed directly and indirectly: Ralph, Driftwood, lpowell, Vitaily, and the many who continue to share so selfishlessly"
Very true!! Actually I did... but after editing my first post the acknowledgements are gone. Stupid. Attached 3 different film settings (smooth, cinema, natural) with 24p25p-NINE at ISO200 + ISO400 to check banding. All set to -2 | -2 | -1 | -2. Smooth at ISO400 looks okay. All other settings show heavy banding. @towi I have NTSC camera and I ran some tests with 720p60 - great; 24p - great, HBRp30 - failure in one attempt, then finally it looked like it worked filming leaves in large avocado tree in the wind, so almost like a death chart of details. Streamparser indicates some blips, see gone B-frames near frame 194.
maybe NTSC users should better stick to the original Sanity patch (GOP18 for 1080i60 + FSH set to 44M). @towi How differs the Settings from 3rd March from this above? Tryed both only on 25p (it´s the only mode I use) both spans, works also on ex tele and give me an average of about 36500 Kps. Both also playback on camera. (On SanDisk HD Video class 10 30 Mbps. The funny thing is that with diftwood settings the camera remaining time shows about 26 min, and goes down slow, with yours shows about 55 min. and goes down faster. I like your settings. I have a request since driftwood says that the 720p at 50p intra settings will span (but not 720p 60p) for us PAL users could be prepared a patch that include this settings for shoot slow motions? (I´m completely ignorant of preparing settings). @towi New settings still looks good in PAL HBR, 24H, 24L, FSH and FH. But SH and H mode have every other P frame low. "How differs the Settings from 3rd March from this above? Tryed both only on 25p" - Re PAL modes it's the same. I've only changed the NTSC settings. "I have a request since driftwood says that the 720p at 50p intra settings will span (but not 720p 60p) for us PAL users could be prepared a patch that include this settings for shoot slow motions?" - Maybe. As LPowell pointed out above, SH settings may also affect FSH (HBR) mode, so we have to try. I've tried to built in one of Driftwood GOP6 settings for 720p, but the camera crashed. "SH and H mode have every other P frame low" - I can't replicate this behaviour on my camera. Actually the 720p settings are copied from the Sanity patch. So I would think they should be okay.